Help: How do I make a payment? 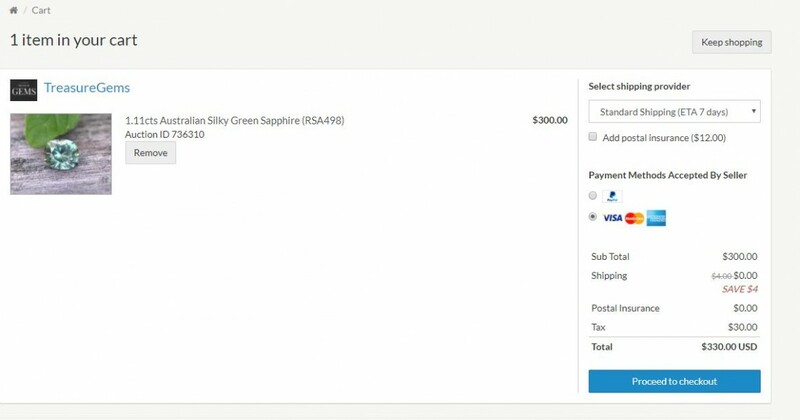 The payment methods accepted by each seller are shown on the item page and also when an item has been added to the cart. If the seller accepts credit card payment you will see the Visa, Mastercard and Amex symbols on the cart page. If the credit card icons are not available you are still able to securely pay with your Credit Card through Paypal WITHOUT having a PayPal account. To pay with your credit card select the Paypal option and then select pay with credit card. Most of our Verified Sellers accept PayPal Account payments. Direct Deposit is a manual process of contacting the seller and arranging to deposit funds into their bank account through a standard bank transfer. By using our inbuilt Checkout, you will have an opportunity to select your shipping provider, add postal insurance (optional), and automatically add tax (where applicable). You will be presented with a list of all sellers whom are awaiting payments from you. It will show items that you have committed to buy via an auction or Make An Offer. It will also show items you have not committed to buy but have just added to the cart. These items can be removed from the cart at any time. We use a 100% secure, PCI certified payment processor to facilitate payments and store your card details for future use (if you ask our website to remember your card). Please check with your issuing credit card company whether you will be subject to international purchase fees when making cross-border payments to overseas based sellers.